Nootropics are a rapidly growing segment of the dietary supplement market, as demand increases for quality products to improve focus and cognitive functioning. The best brain supplements for mental focus are formulated with a blend of quality, natural ingredients, rather than synthetic compounds to produce increased mental focus, memory, and energy without serious side effects. The increased demand for focus pills has resulted in a significant growth of new products on the market. You can read independent product reviews of Focus Formula and other focus pills & learn how to improve focus at Smart Pill Guide. Read product reviews and customer reviews to find information about the ingredients, effectiveness, dosage & side effects of supplements to help you make an informed decision. Focus Formula is an herbal supplement for mental focus that increases concentration, attention span, memory, and offers mood balancing benefits. The supplement is available in dosages for both children and adults to support brain and nervous system function. People of all ages use this supplement to improve ADHD symptoms without prescription drugs. 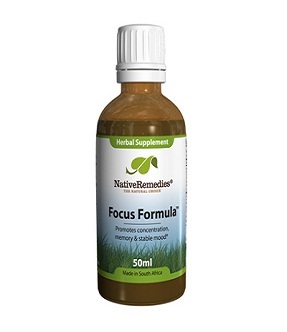 Supplement manufacturer Native Remedies claims Focus Formula improves the user’s ability to remember new information. These claims are supported by positive product reviews and customer reviews. This supplement is popular among college students seeking improvements in their study efforts. As with any supplement, you should always follow the manufacturer’s dosage instructions. There are different dosages for adults and children. For adults and children over the age of 16, take 1 ml of the product twice daily, after meals. The dosage for children is 0.5 to 0.75 ml twice a day. A dropper is included with the product for easy dosing. This supplement is made entirely with natural and herbal ingredients, so people who find side effects of prescription drugs for ADHD intolerable often choose this supplement to enhance focus and concentration. Although side effects are uncommon, some users have reported headaches, dizziness, and skin reactions when using Focus Formula. Determining if a supplement works can be challenging, especially if you rely only on the product website for information. Focus Formula has many positive reviews and users report increases in memory, focus, and attention span with regular use of this supplement. Focus Formula is trusted by more than a million people in 30 countries around the world. At Smart Pill Guide, we are committed to providing a useful resource for people to find information about the best quality focus pills. We encourage you to browse through our website to read and compare product reviews to find a supplement that addresses your specific concerns and read our blog to learn how to improve focus and memory.